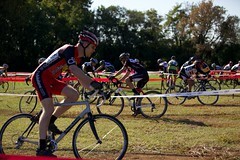 Hyattsville CX went off October 10 under sunny skies and seasonably awesome temperatures. Was it traditional cyclocross weather? It was for Hyattsville, your fast and sunny race in the MABRAcross series. We have helmet-cam footage from the Masters 3/4 race. I had the seat-stay cam hooked up but it was too shaky to watch. I think the multiple early season crashes have loosened up the mount. Probably about time to reapply the superglue. Stoked to have tracks from Park Police and Qway for this latest video. I think you are going to dig these bands. Good, driving pop/punk tunes. The kind of stuff you pop into the ears warming up for a race. You can check out more from Park Police at www.myspace.com/parkpolice and Qway at www.myspace.com/qway. Thanks to Neil Schirmer for putting me in touch with these guys. Alright, go watch the vid and then meet back here soon for DCCX coverage and much, much more. Thanks for watching. Bill, Great footage and a great day of racing. I’m honored that you used a pi of me in the Spriral of Death. Major Props to Rt. 1 Velo for putting it all together. See you Sunday.